The EU has agreed to ban the import of seal products - prompting a challenge from Canada which culls hundreds of thousands of seals each year. European foreign ministers agreed on the ban following years of appeals from animal rights campaigners. Products from traditional hunts by indigenous peoples in Canada and Greenland will be exempt from the ban. Canada says the decision is not based on science and it will challenge it at the World Trade Organization (WTO). The EU ministers' decision follows a vote by the European Parliament in May to ban the sale of all seal products across the bloc's 27 nations. Ministers said on Monday that the ban was being put in place "in response to concerns about the animal welfare aspects of seal hunting practices". 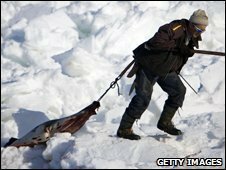 Every year Canada kills about 300,000 seals off its east coast - the biggest such hunt in the world. Hunters usually shoot the seals or bludgeon them to death with spiked clubs. The animals' pelts, fat and meat are traded. Anti-hunt campaigners say the practice is inhumane, and claim that some seals are skinned while still conscious. Lesley O'Donnell, of the International Fund for Animal Welfare, welcomed the EU ban. "We expect the commercial seal hunt to continue its inevitable decline until it is wiped out once and for all," she said. However, Canada has insisted that the hunt is carried out humanely, and says it will launch a challenge at the WTO in Geneva. "We are very disappointed with this ruling. We believe strongly this violates the World Trade Organization guidelines," said international trade minister Stockwell Day. "It is in our view inappropriate that a trade decision is taken which is not based on the science, and for that reason, we are announcing that we'll be pursuing an appeal of this vote today." EU diplomats have said that the ban - which will affect the 2010 hunting season - will stop an annual trade of some 4.2 million euros (£3.6m or $5.9m).